Until now, the effort to "globalize" hansik (Korean food) was a forced attempt by the government, which left little impact. Hansik couldn't be described as anything more than kimchi, bibimbap or bulgogi and only a few typical items were selected to promote to foreigners. But hansik is much more than that, and its promotion needs to be changed in order for Korean food to be anchored into people's lifestyles, according to newly appointed "supporters of Korean food." Three foreigners who rose to fame for their perfect Korean in a local TV program _ Daniel Lindemann from Germany, Alberto Mondi from Italy, and Guillaume Patry from Canada _ have been named the "Healthy Korean Food Supporters" for the Korean Food Foundation's World Hansik Festival. The annual festival kicked off Thursday and will last through Oct. 15. An opening ceremony was followed by hansik-related activities on the first two days and the rest of the period will be dedicated to voluntary partner restaurants serving specially created dishes for festival participants. With their new roles, Lindemann, Mondi, and Patry were eager to promote hansik from a foreigner's point of view. The three, along with two Italian government officials from the Autonomous Region of Sardinia _ President Raimondo Mandis and General Director Massimo Temussi _ who have signed an MOU with the Korean Food Foundation and were in Korea for the first time, sat down with The Korea Times in a roundtable interview to discuss the future of hansik. "I think Korea needs to promote Korean food the right way. When the government tries to promote Korean food, they try to please everyone. They don't promote the real thing, they promote bulgogi and bibimbap _ the easy-to-eat stuff _ and sometimes they don't even give you chopsticks, they give you a fork which, in a foreigner's point of view, is not funny you know," said Mondi. "Sitting on the floor, chopsticks... it's hard but they will go back to their countries and tell their friends it was such a good experience. I think the real thing needs to be presented to people. The common thing that you eat is rice, guk (soup) and banchan (side dishes). You can start from that. My friends, when they saw so many dishes, they went 'Wow!'" Koreans also shouldn't water down the food to meet foreigners' taste, he said. "Like sundaeguk (stuffed sausage soup). I think it's a great dish. Italians would love it. We can eat spicy food with no problem, but many Americans, they might have problems. You can't please everyone. You don't need to make non-spicy Korean (because of that). Spicy is just spicy. It's their problem if they can't eat it, they'll find something else." Patry, said, "I have lived in Korea more than half my life and I ate more hansik than any other kind of food. And the thing I like the most is the ingredients_ they're not blended. You can see what you're eating just by looking at it. So, Korean food focuses more on the ingredients and the taste than the visual." Mandis said, "I noticed that there's very keen attention to organic, healthy products, and to the presentation of food." "Italian food is devoted to the quality of raw materials which is different from French cuisine which is a layer of flavors. We just have grilled meat like you do in Korea. In that sense, I think we share similarities," he said. He remembered the Korean pavilion during the Expo Milano in 2015, which he thought was great, and had the longest queue. But to make Korean food more known to westerners, more needs to be done, he said. "Chinese food, to most Europeans, tastes the same. Because you don't know what is good Chinese or where you can pick high quality. This is the big mistake with Asian food generally speaking _ not understanding the right differences. Again, because Korean food is very natural, healthy, mostly organic, this is the good point. Not to follow other countries, but instead having it your own way." 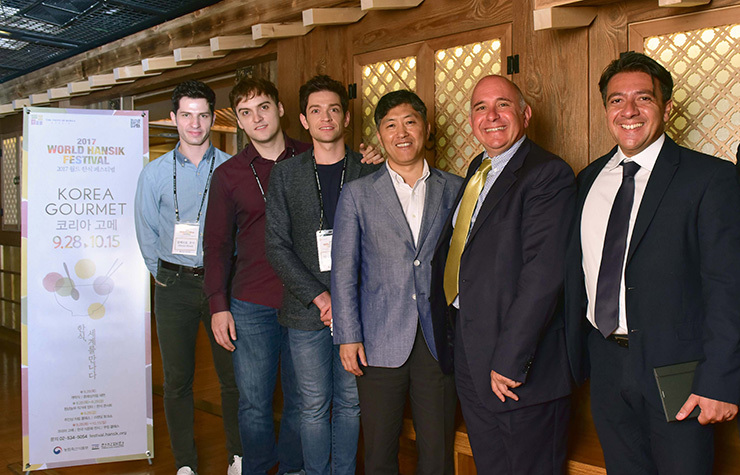 From left, TV personalities Alberto Mondi, Guillaume Patry and Daniel Lindemann, food service industry division director Lee Kyu-min of the Ministry of Agriculture, Food and Rural Affairs, President Raimondo Mandis and General Director Massimo Temussi from the Autonomous Region of Sardinia pose for a photo after a roundtable interview with The Korea Times, Thursday, in Gwanghwamun, Seoul. But when promoting hansik, Koreans should ask themselves why they want to globalize it. "Korean food is already globalized but it depends on what kind of globalization you want. Do we want it to become like popular and cheap Chinese food? Or valued fine dining? We need to think about what values we want to create. You have to be careful of how you globalize it because it may lose its value if you globalize too much," said Lindemann. "Italian food is totally globalized but people think of just pizza and pasta so they still have the prejudice. If you want globalization, you should have globalization without prejudice. For that reason, you need a lot of information of course. From my point of view, I think there are so many other great things about Korean food than kimchi. So I think promoting the philosophy and history of the food is what people should focus on." For his country, promoting Korean food's philosophy would work best, he said. "Because Germans are interested in philosophy and Korean food has the philosophy of these five different tastes called 'omi' where every taste is responsible for different elements in your body, I think this should be developed and conveyed _ that Korean food is not just healthy food. Asian food is all healthy but (you need to) expand beyond the health and explain the philosophy and culture. Then it becomes really interesting for Germans," said Lindemann. As for the potential of hansik overseas, they said the future was positive in their own countries. "It's got huge potential actually. Canada is only 150 years old. So we're really good at adopting other countries' best dishes. We bring the best of all the cultures and I think we can do the same with Korean food," said Patry. "In the far future, I want to open up my own Korean food specialty restaurant in my hometown_ something simple with only one item on the menu like galbitang (beef soup)." Lindemann said German food is adaptive since they have received many immigrants since the 1950s. "We have many Italian, French, Spanish and Chinese. So I think Germans are principally open-minded." Mondi said he wanted to work on the Italian side, "not only on food, but on everything." "Until now, I had been showing Koreans how foreigners appreciate them through columns, and TV shows. It would be nice to do the opposite thing. I can show Korean food and culture to Italy to Europe." All of these ideas were an awakening to Lee Kyu-min, the food service industry division director at the Ministry of Agriculture, Food and Rural Affairs, who said he had never thought of Korean food the way they viewed it. "I realized how much affection you all have about Korean food and know more than I do. To me, it was no more than a daily meal; I never thought it was a proud cultural heritage. But we Koreans need to be proud of our food and share it," he said. "I also learned during this talk that we don't have to try too much to adapt our food to people. We have to try to preserve and maintain our core and share the value with people."